Gluten is a protein found in most grains including wheat, rye and barley. Derived from the Latin word for glue (that’s right…glue! ), gluten is what gives bread dough its elastic texture. For Celiac disease sufferers, gluten triggers a heightened immune response in the small intestine, and therefore must be strictly avoided. But there’s a growing subset of the population being diagnosed with “non-Celiac gluten sensitivity,” for which gluten can not only cause gastrointestinal symptoms, but also headaches, fatigue, joint and muscle pain, depression, and anemia. For this reason, we are seeing a growing number of gluten-free food products lining store shelves – everything from gluten-free flour to pancake and muffin mixes. And perhaps because of this increasing prevalence of gluten-free products, many folks erroneously believe that gluten-free is synonymous with healthy. While gluten-free products may be easier on your small intestine, from a weight management point of view they are a really bad idea. Here’s why gluten-free products will make you fat. 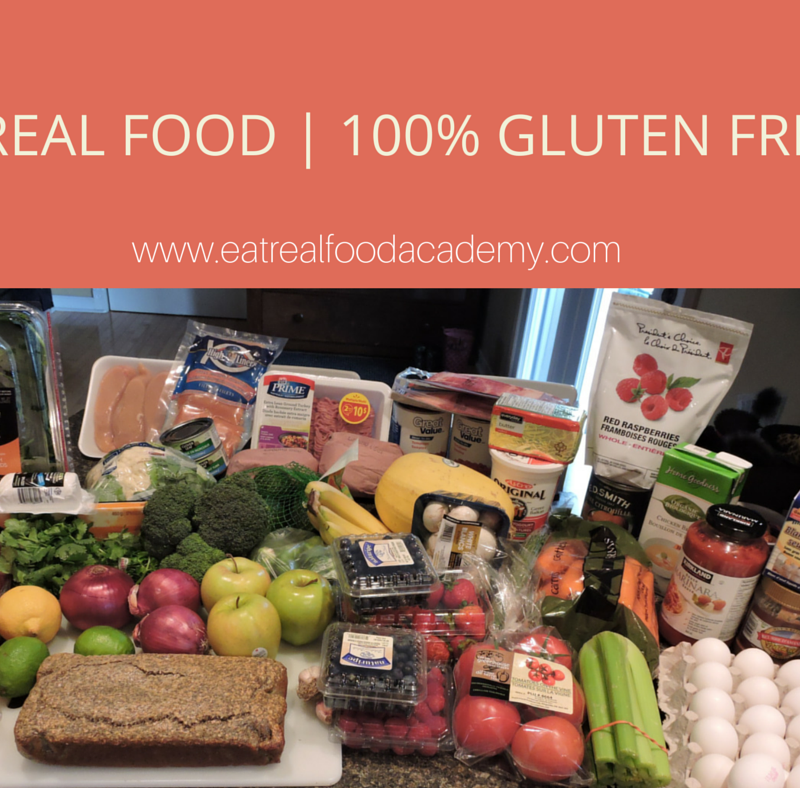 Gluten-free products are typically made from rice flour, potato starch, tapioca starch, buckwheat, cornstarch, xantham gum – or some combination of the above. These highly refined ingredients spike the blood sugar and trigger insulin release – the fat storage hormone. Insulin’s primary job is to store fat for later use. The problem is that in order to be able to burn stored body fat, insulin must be low. And insulin is never low if you eat a high carb diet of gluten-free products. 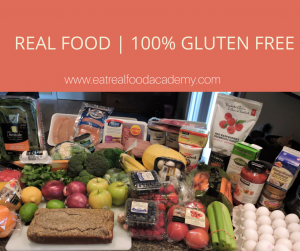 Bottom line: Eat gluten-free (hint: eat real food! ), but be very skeptical of products that are marketed as gluten-free. Please don’t fall into the trap of assuming that all gluten-free foods are healthy. Marketers have exploited our lack of knowledge around this subject, and as always, it behooves us to do our own research into the foods we put into our bodies. Carolyn had the recent pleasure of interviewing Kim, a graduate of our Eat Real Food Academy program. It literally gives us goosebumps to hear about success like this from the simple act of eating real food. Restful sleep for the first time in years. Sustained energy throughout the day. Joint pain and hot flashes a thing of the past. Check out Kim’s full interview here. Have you ever experienced food cravings, energy crashes, fatigue, bloating, aches and pains, digestive upset, skin rashes, chronic inflammation, unstable moods, binge eating or feeling out of control around certain foods? 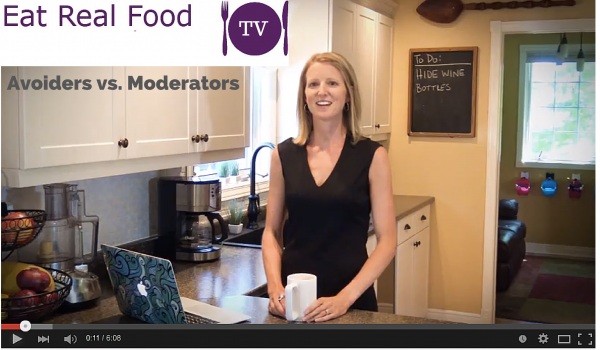 Have you ever attempted to address these issues – by restricting or eliminating certain foods – with mediocre results? And then attempted to address them again, promising yourself that this time will be different? You will be more disciplined. You will have more motivation and willpower. We all do this right? Approach a stubborn problem in the exact same way we always have, yet expect different results. Albert Einstein would call this the definition of insanity. It’s not trying harder. It’s trying differently that really gets results. In order to make any progress in the direction of our goals, we must be willing to swallow our pride and admit that there might be a different way – a better way. A way we have never tried before. Maybe – just maybe –calories aren’t all created equally and eating fat doesn’t always make us fat. Maybe agricultural foods – a relatively new introduction to our diets – are not as healthy as we once thought. It can be scary to turn these popular paradigms on their head, but if you aren’t getting the results you are looking for, it might be worth the gamble. Do your research. We then have to demonstrate the courage to step outside of our comfort zones and actually give our new approach a fair shot. Until we go thirty full days eating only real food, how can we say it’s too hard, too expensive, or not worth the effort? It could be the uncharted territory that finally solves your most longstanding physical ailments – the ones you surrendered to being stuck with for the rest of your life. So many of us quit as soon as the going gets tough, instead of seeing our efforts all the way through. This is especially true when forging better nutrition and exercise habits because there are so many ways to fall off the wagon these days (which in itself is not normal!). We get impatient. We want the results right now. When something isn’t working for us, it’s probably because of they way we’re approaching it. Instead of doing the same thing only harder – with more discipline, focus, and intensity – what if we took a completely different approach? 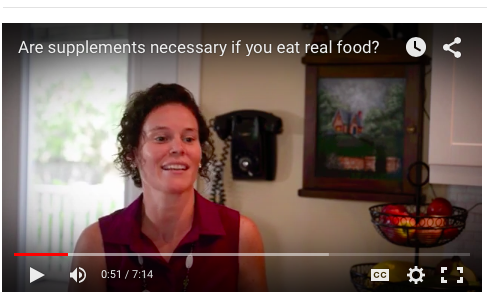 Our Eat Real Food Academy graduates are always marveling how once they overcome the initial learning curve, it’s actually easier – not harder – to just eat real food. Especially when they start to realize all the benefits to their health. What if this were the missing link for you? Do you want in? Eat Real Food Academy registration opens January 14th, 2015. We’ve almost reached the end of another fantastic year. After publishing two articles a week in 2014, I’ve compiled the 10 most popular. 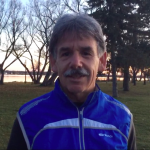 I started this tradition last year when I shared my Top 10 Blogs of 2013. It’s always interesting to see which articles resonated with our community. Until I broadened my definition of sugar, I was in complete denial of how much of the stuff I actually ate. Not in the white, crystallized form, but in the form of complex carbohydrates that we’re told are healthy. In my quest to get enough fiber from whole wheat, brown rice and steel cut oatmeal, I was crowding out the vegetables, healthy fat and protein that my body really needed. And unbeknownst to me, this led to seventy five percent of my calories coming from sugar! A participant of our very first Eat Real Food Academy over a year ago, Skye has not only been able to maintain her healthy habits long term, she has also gone on to inspire countless others as well. We love to see that ripple effect! I like Costco because the price is right and there is little-to-no variety for any given product. So in theory, it saves me both money and time. But after reading the bookMindless Eating, I learned about how we subconsciously consume more from larger packages, which of course at Costco they all are. That’s the whole point. I ate a salad at every meal for three days straight this past summer. No, I didn’t lose a bet! It actually just worked out that way. Find out the circumstances behind my summer salad-apalooza in this post (which went a little bit wild on my Facebook page). Given what I do, so many of my conversations with people revolve around their food habits. Whenever it comes to sharing their vices or less-than-ideal habits with me, I very often hear a hint of guilt and shame in their voices. Like they’re worried I’m judging them. In this post I go on the record explaining that I’m not. I’m really not. This article explores a variety of different beverages that remain on the menu when you finally come to terms with the benefits of giving up pop, including several recipes. This inspirational story goes to show that armed with the right information, you can be your own health crusader. We’ve probably all had those dreaded conversations with people who come on a bit too strong following their success with this diet or that diet. “You’ve gotta try it. The weight is literally falling off of me. 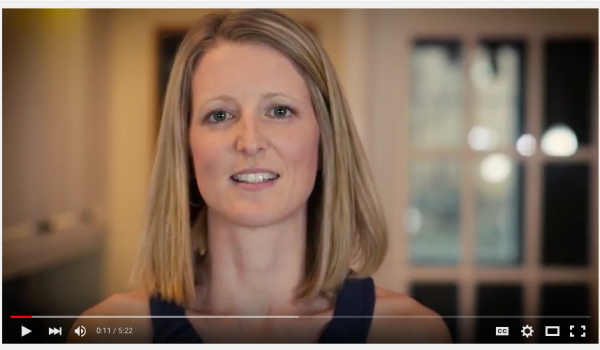 And the best part is that I’m never hungry!” While many of our clients do offer these kind of testimonials, I think they can sometimes be misinterpreted — as if to suggest that chocolate bars and candy all of a sudden taste revolting, which is virtually never the case. It’s just that these foods don’t hold the same power over you when you consistently eat real food first. 9. Food Chemicals: Are We Fighting the Right Battle? This article discusses the so-called triumph against a large food chain which, in response to a food blogger’s petition, agreed to remove a potentially harmful “yoga mat” chemical from its bread. While everyone loves a good David and Goliath story, I urged readers to consider if this kind of fight is a good use of their energy. While it’s undeniably a good thing to put the pressure on large corporations about being more transparent about the chemicals that are lingering in their processed food, wouldn’t it just be easier to skip the processed food altogether? Unless you want to be spending more time meal prepping than you really need to, get acquainted with batch cooking! It is arguably the key activity that can make or break your long term success with eating real food. Especially if you have a busy schedule. And finally, my most popular recipe of 2014 was Cauliflower Crust Pizza. Browse the Best of 2013 or sign up for my weekly newsletter to receive these posts directly to your inbox. If the answer is yes, then you’re probably legitimately hungry. If the answer is no, then you’re probably under the influence of a food craving. But as we all know, properly diagnosing a problem is only half the battle. Figuring out the best course of treatment is equally important. Distraction can be powerful when used for good. Distraction gets a bad rap. There is virtually no shortage of modern distractions — from text messages, to social media, to petty gossip — that can lure us away from accomplishing our most noble goals. As Mark Sisson points out in his book The Primal Connection, humans are hardwired to be distracted. Having our attention diverted to unusual noises and obstacles in our environment provides a distinct survival advantage. It’s just that we were never designed to be distracted as frequently as we are today. The good news is we can capitalize on the fact that we are highly distractible creatures and use it to our advantage if we struggle with food cravings. Here’s how. Most food cravings are triggered by our emotions (boredom, stress, happiness) but pass within fifteen minutes, especially if our attention is diverted. So it stands to reason that if we temporarily distract ourselves at the onset of a food craving, then we substantially decrease the odds of succumbing to it. The exciting thing is that, even if we have fallen victim to food cravings all our lives, we can train ourselves to strengthen new (healthier) neural pathways in the brain to take over in those moments. If you’re anything like me, you’ll find it quite empowering to know there’s something you can do. Food cravings need not control you any longer! Here are my top four go-to distractions for overcoming food cravings. Particularly if my craving arises after an extended period of intense focus, I like to get my body moving. It may be a 5-minute walk outdoors, a quick set of push-ups, chin ups or squats, or dancing with my kids while our favourite song blares. There is no doubt that physical activity does wonders to mitigate food cravings. Sometimes I can reel in a food craving by simply chewing a piece of gum. How easy is that? Cravings can often be thirst in disguise, so downing a glass of water, herbal tea, or other approved beverage often does the trick. We are social beings, and we thrive by connecting with one another. Sometimes our cravings, especially after prolonged periods of work, are a sign that our social muscles need to be exercised. This may involve phoning a friend, catching up on social media (set your timer for 5 or 10 minutes so you don’t overdo it! ), or sending a quick email to tell someone you care about that you’re thinking of them. Use these four distractions, or better yet, come up with a list of your own that you can reference when your next food craving strikes. We really can train ourselves to forge healthy coping skills for our wide array of human emotions. Please leave us a comment describing your number one go-to distraction for overcoming food cravings. Who hasn’t experienced a food craving? You know what I’m talking about. When you feel like eating (insert highly processed food), but don’t feel like eating (insert nutrient-dense whole food). I have come up with a way to identify junk food cravings with incredible accuracy. Don’t get me wrong, I love baked salmon and steamed broccoli. But when I’m under the influence of a food craving, it is never what I feel like eating. That’s how I know I’m not hungry, but rather trying to satisfy another emotional need. Stay tuned for my next post where I discuss some practical tips for overcoming junk food cravings.